This charming hotel is located in Jacksonville Area. There are a total of 95 guests rooms on the premises. This is not a pet-friendly accommodation. This lovely hotel is in Jacksonville Area. 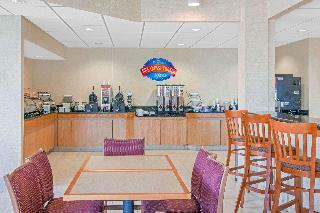 Baymont by Wyndham Camp Lejeune features a total of 116 guests rooms. Internet connection (wired and wireless) is provided in common areas for those needing to keep connected. The property provides 24-hour reception. Common areas are suitable for wheelchair-disabled people. It is possible for guests to bring their pets to the premises. Guests arriving by car may leave their vehicle at the accommodation's parking spaces. The hotel may charge a fee for some services. This charming hotel is situated in Jacksonville Area. The 73 welcoming units offer a perfect place to relax at the end of the day. Apart from the services and amenities offered, visitors can take advantage of the wired and wireless Internet connexion available in public areas. This establishment offers 24-hour reception for guests' convenience. Pets are not allowed at Days Inn by Wyndham Jacksonville NC. Travellers may take advantage of the car park. This Illinois establishment lies at the junction of Interstate 72 and Route 267. It is 10 km from Jacksonville Municipal Airport and affords easy access to Illinois College and MacMurray College. The Abraham Lincoln Presidential Museum, 45 kilometres away is well worth a visit. All guest rooms are well equipped with refrigerator, microwave, cable TV, iron & board and coffee maker and the hotel provide accommodation for smokers and non-smokers. An indoor heated pool, hot tub, health club/spa and an exercise room are available. The following are among the hotel's free amenities: a hot and delicious breakfast, afternoon tea, wireless high-speed Internet access and free local calls. Laundry and valet-cleaning services are also a plus. There is plenty of outdoor parking for buses and lorries. This pet-friendly hotel allows a maximum of two per room (ask about fees).